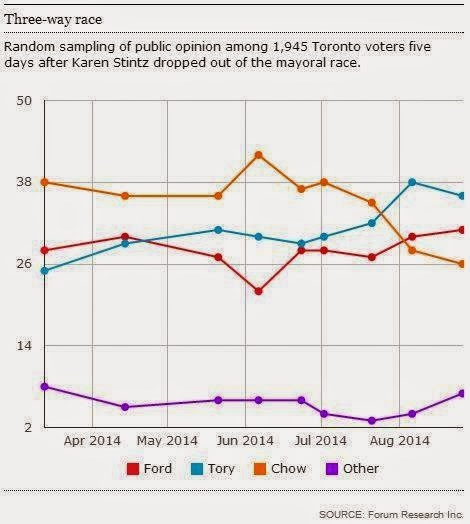 For anyone who is concerned about apathy in politics might find the Forum Research Poll on the Toronto mayoral race really disturbing. Mayor Rob Ford might be on the "comeback trail." I would say I was shocked, but after a few conversations with ex-pats residing in Toronto who were home for holidays over the summer - I was numbed by the level of serious support they offered for the crack-smoking leader. It is all so outrageous that it seems ridiculous. Why, I would ask? Despite his serious bad acts, they like his unpolished and rough approach. They feel he has taken advantage of his office or City funds. In short, Ford for all his failings is not out for personal gain like Senator Duffy or Senator Duffy. They feel he is not a greedy son-of-a-gun out to line his pockets and screw the taxpayer, and he has a strong constituency of supporters who are not embarrassed to support him despite his unorthodox approach to respect for the office he holds.